What immediately springs to mind are the outliers. The points on the graph that do not seem to fit in with the overall trend. Although it is expected that there will be variation and bucks to the trend, the single dot on the far left of the graph should still be explained. This dot represents Japan. My figures for religious belief in this country may well be inaccurate, and if so, Japan should take its rightful place on the graph, further to the right of its position as I have plotted it. Even if it were to do that though, it does not make a difference to the trend of the graph overall, and if anything would only strengthen the graphs findings, as it would be seen as less of an anomaly. As I have said, even if the figures I have used to represent Japan are incorrect, and its point on the graph was moved to the right, the trend of the graph would remain unchanged, and so the single issue of Japan is somewhat irrelevant. Another anomaly for me is the point located at around the mid-40 mark on SPI and just past 80% in religious belief. This point belongs to Mozambique, and remarkably is the only point that occurs at below 60 SPI once a nation drops below 92% of the population being religious. The figures for religious belief in Mozambique come from a census conducted in 2007 where 18.7% of the population declared that they had no religion. This information can also be found on the CIA website, and makes Mozambique the most irreligious country in Africa. With those two anomalys explained, here is another look at the graph with a few other nations labelled for reference. I should clarify here that my definition for people who are religious are those that have recognised themselves as non-Atheist, or those that have confessed to belief in some god and/or deity. The worship of spirits and/or ancestors has also been included in the religious bracket. Essentially anybody that has not openly stated they do not believe in any higher power, has fallen into the category of a religious believer, and so has been included in the figures used to measure the percentage of the population who are religious. 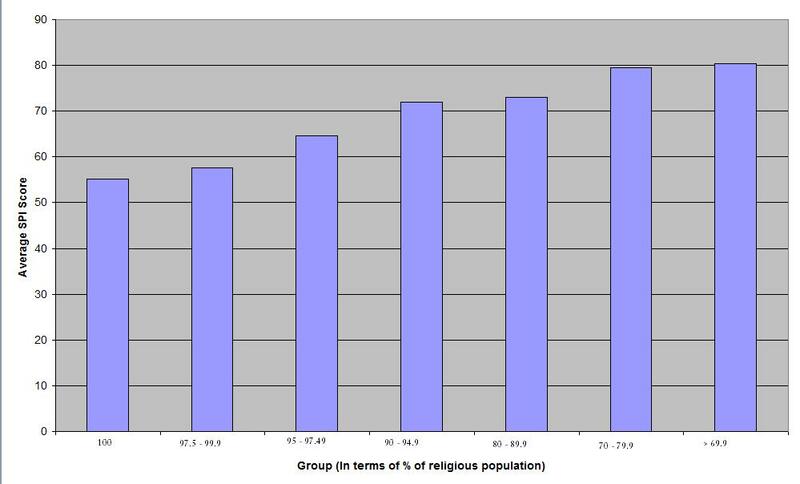 As you can see by the graph, a large number of nations have been given a 100% religious population rating. Now in reality it may not be the case, but nations with 99.9% or 99.76% are so close to 100% that they have been included as that. Nations such as Algeria, Bangladesh, Cambodia, Egypt, and all the other 100%-ers may well have little pockets of non-believers within their society, or a small community of Atheists, but in the grand scheme of things, these numbers are so minuscule that they make no difference. The sheer number of 100%-ers led me at first to believe that the graph was so heavily weighted towards one rating that no conclusions could be drawn from it. I toyed with the idea of removing all those nations and redrawing the graph to see the results. In the end though, I decided to leave them as they were because this was the result the data produced, and to start removing large numbers of data points would compromise the graph and any analysis to be taken from it. I believe that we should not distort the graph just because it contains elements that trouble us, or that we do not wish to see. I grouped the nations and made a note of the highest SPI rating from each group. Not much can be taken from the collection of these figures, but it is interesting to note that until you drop down to 93.2% religious belief, no nation achieves an SPI score above 80. From 93.3% religious belief upwards, the glass ceiling is set at 77.44 SPI, the score of Poland. Whilst analysing the data from the graph I roped in an old friend of mine, Ben McBride. He is a maths teacher and so I was hoping that he could highlight errors in my own analysis, and spot things that I had missed. McBride also believed that grouping the nations may be able to tell us something, but he believed that the method of grouping would have to be changed as there were so many nations who fell under the 100 and 95 – 99.9% categories. He recommended that we split the groups more evenly so that we had similar numbers of nations in each group. We split the groups as evenly as we could, though the sheer amount of 100%-ers meant that that group had a far higher number of nations within it in comparison to the other groups, which were fairly evenly distributed. The findings from these groupings proved to be far more interesting and useful, and are shown below. 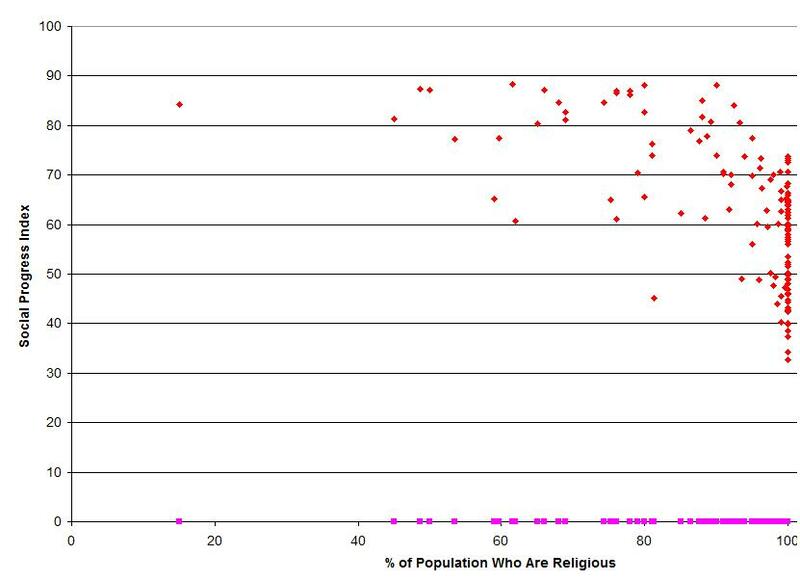 These results are fairly conclusive, and they show us that the further a nation moves away from a 100% religious population the higher its SPI score will be on average. This is demonstrated in the graph below. If this graph is accurate, then we can use it to make predictions for the future. The undeniable trend is that the less religious a nation is, the higher its SPI score is likely to be, and so we can hypothesise that as a nation becomes less religious it will be reflected in an increased SPI score. This is something that we would have to monitor for a number of years in order to see if it is true, but the findings from this data point strongly towards that occurring. In order to give even stronger findings, and therefore more accurate predictions, what we would need is a more even distribution of religious following. Rather than having 59 nations grouped in the 100% category, it would be useful, in terms of analysis, if this figure dropped, and nations moved into other categories. The groupings themselves may well have to change, but as long as the nations are evenly distributed along the groups then the same analysis can be conducted, and I would expect similar results to be found. In Michael Green’s TED Talk, he compares the SPI scores of the nations, with the GDP. The graph is plotted and it shows a positive correlation between the two. The higher a nations GDP, the more likely they are to have a high SPI also. The high GDP does not necessarily cause the SPI, but it does affect it in some way. These findings are unsurprising really as with more money a nation can invest in better healthcare, better education, sustainable approaches to the economy and environment, and a number of other areas which will improve their SPI score. The more access to money a nation has, the easier it is to raise its SPI score, and the higher a nations GDP is, the more likely it is to have a high SPI score. The same sort of relationship is true also of SPI and a nations religious population it seems. Though a low percentage of religious followers within a nation does not necessarily cause an increase in SPI, it does have an impact on it. From the data we have gathered and analysed, you are able to say with some confidence that the less religious a nation is, the more likely it is to have a higher SPI score. Just like with the GDP comparison, so too religious belief seems to impact on the progress a society can make. A higher GDP suggests a higher SPI rating, and so too a lower percentage of the population who are religious, also suggests a higher SPI rating. I, for one, am not surprised by these findings, and when I began to conduct the research and analysis, I was half expecting this to be the outcome. 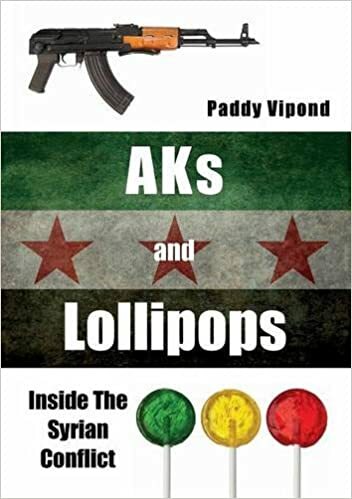 A nations SPI is based on a wide variety of topics and as religious belief controls almost all aspects of a human beings life, it is unsurprising then that religious belief and following would impact on SPI. For a deeper understanding of how religion does that you would have to compile a case study on each nation, and analyse and evaluate their data points that help to make up its SPI. This was not the aim of this piece of writing so I won’t delve into it too deeply, but on a shallow level it is obvious when you look at issues of health where in some countries contraception is prohibited by religion and AIDS is widespread. In terms of press freedoms there are nations who forbid the printing of irreligious content and so this is likely to effect their SPI score. Freedom of life choices, and even freedom of religion, are topics which are both tightly regulated by religious organisations. Some nations do not allow for abortion, and some nations do not allow for atheism even. Again, both would impact on a nations SPI. The treatment of homosexuals would be another area where religion would impact a nations rating. What really excites me about the Social Progress Index is the opportunity to track a nations progress year after year, and to possibly see why such progress occurred. Was it a huge financial investment in education? Was it the reversal of a controversial law? Was it the rise of a new left-wing movement? Was it a rise in GDP? Was it a fall in the number of religious people within the nation? It is truly fascinating, and once you are able to measure the effects that such actions have upon a nations SPI, other nations can follow suit and implement similar actions in order to improve their own society. By tracking the SPI of nations, governments and administrations can be objectively evaluated at the end of each of their terms in office, and there would be a defining measurement which could be applied to their time in office. SPI ratings before and after terms in office would clearly show just have much progress, or regress, has been made under that leader. The Social Progress Imperative has huge potential, and I would hope that it becomes as necessary and as powerful as other measurements with which to assess nations. Not only is it providing us with the data and the results for today, but it is providing us with the blueprint for tomorrow.